It's that time again to celebrate another rescue and successful adoption. A year has passed since Charlie was rescued, adopted and rode the magic carpet to an exotic new home--Abu Dhabi of the United Arab Emirates! Charlie's story is special. So much that we devoted a three-part series of blog postings. For a brief recap before we get to the contest, Charlie was dumped and abandoned in our neighborhood. In the nick of time, he was adopted by a young couple. 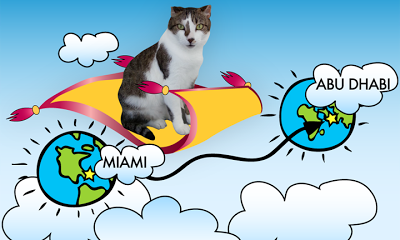 But then Nina and Felipe were leaving Miami and moving to the Middle East! What about Charlie? As responsible pet parents, they planned and coordinated special air travel for their new family member and spared no expense. No hesitation. 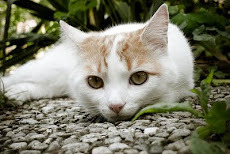 We wondered about the care of cats at a local cattery in Abu Dhabi and Charlie's adjustment to a condo in the desert. Charlie is living the good life. From the humid, palm tree city of Miami, to the desert and palm tree city of Abu Dhabi, Charlie has struck it rich! 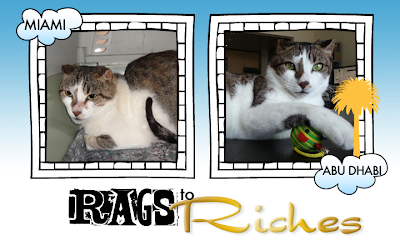 So now it's time to celebrate with another RAGS TO RICHES contest. A $100 airline e-gift card for your choice of American or Delta Airlines. Your choice of red or white handsome travel tote with cat imprint. A hand held digital scale to easily weigh your luggage. Where would you go if you win? OK now for the rules. Please read carefully as this contest will utilize the Rafflecopter. If you never used Rafflecopter, it's easier than it appears. The trick is to click on the down arrow buttons next to the numbers like "+1". Then enter information if requested, and then click Enter. Easy Peasy! 2. Submit your email address--please see Rafflecopter below and in the box where it states "Please leave a blog post comment..." click on the down arrow next to "+1" and a drop down box appears where you can enter your email, then click "ENTER". It's that easy! (Your email address is strictly for a way to contact the winner and will not be shared or disclosed). Leaving a comment and submitting your email is mandatory. There are other ways to gain additional entries but they are not required. This contest is open to residents of U.S. Canada, U.K. and Australia and New Zealand. Contest ends at midnight August 1, 2013. 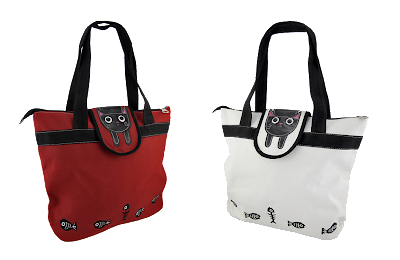 The winner will be announced any day after August 1 and will receive an email from us. Winner must reply within 48 hours. This is our way of giving back to you our supporters, followers and donors. THANK YOU and Good luck! And a huge thanks to our generous donors for the prizes! Please remember to Vote for RIVERFRONT CATS and ZEE ZOEY in the Petties so we can continue rescuing more cats and educating the masses about responsible pet care to reverse the rate of homeless pets. 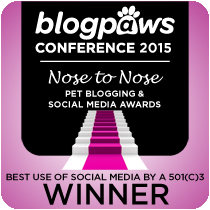 To our new followers, Riverfront Cats has been nominated for a Pettie, an award bestowed to popular pet bloggers. We are so thrilled as this is our first time entering and we are finalists for two categories. 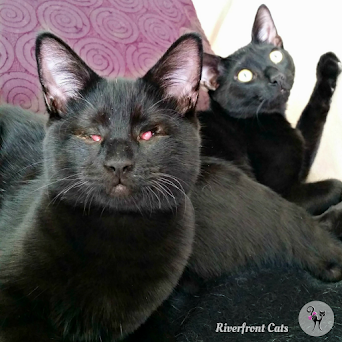 Riverfront Cats is a young blog and small nonprofit compared to our fellow finalists. We appreciate them as many finalists are friends. So it's all in friendly spirit. 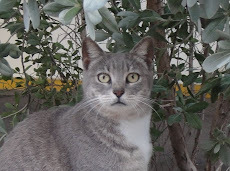 Working with feral cats we see plenty of clawing and hissing. So this is a refreshing and fun challenge! To win, we need your help to VOTE DAILY until July 31. It's very simple! Log in here using your Facebook or email. Find the categories, and select Riverfront Cats and Zee & Zoey. 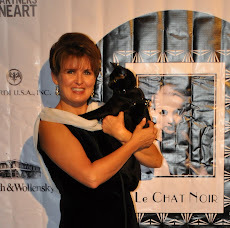 Zee & Zoey - Best Designed Blog (Deb Barnes has selected our nonprofit to receive the donation). What do we win? A trophy and $1,000 donation. 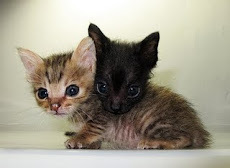 We could really use the funding to spay and neuter more cats and rescue more kittens and especially black cats from the streets, treat and care for them, and find them permanent, loving homes. Thank you for taking a few seconds to vote. "So this is how humans live. 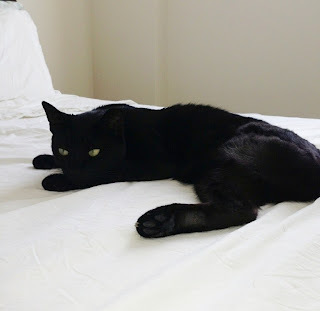 Didn't take long to get used this comfy, soft, ant-free, non concrete bedding." We have an update on Leroy, the outdoor community black cat that lost his back hind leg. His recuperation is going smoothly and he's adjusting to living indoors. Leroy is certainly enjoying sleeping on a cool, not humid, soft human bed instead of hard, hot concrete. "... but I miss climbing and running. These condos don't have any trees or lumber piles like my old backyard." But there's more good news! 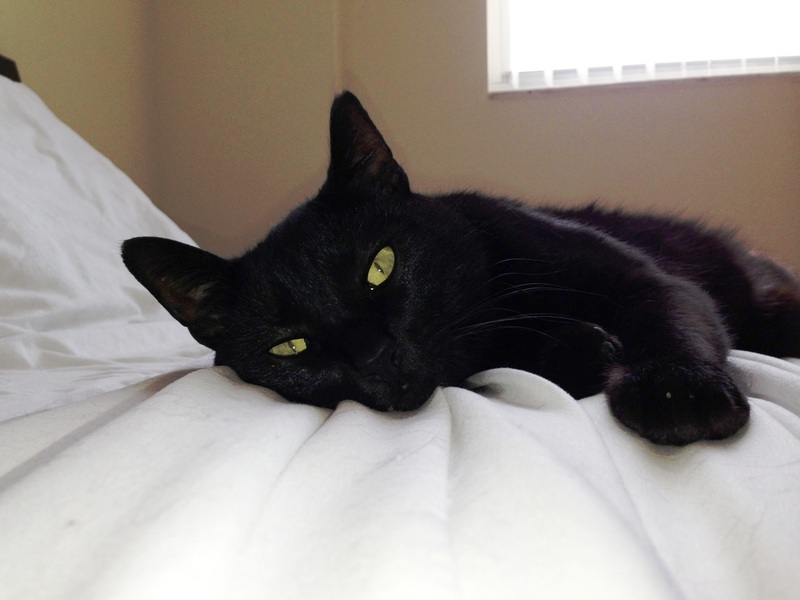 Our volunteer Sabrina has decided to keep him along with her three other cats. It was evident Leroy was in shock from both losing his leg and adjusting to a new environment. 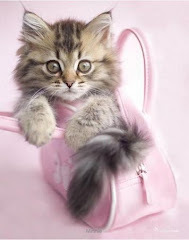 Often for cats a strange environment is more stressful than losing a limb. Given that Leroy was comfortable with Sabrina and allowed her and other volunteers to pet and hold him, we knew finding him a new home would cause additional stress. So for now, he's happy. 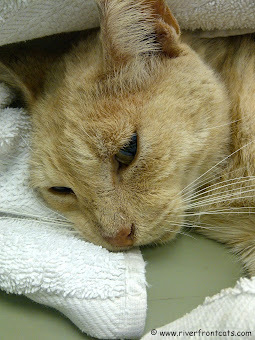 We are still collecting donations to pay off the credit card bill for his treatment and surgery ($2,600). No amount is too small or large. We are extremely grateful for any amount whether it's $20 or $200 or $2000. Simply click the button on the right. 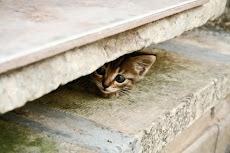 Aside from losing his leg, Leroy is a healthy cat and exhibits signs of curiosity and adventure. He clearly misses climbing trees and running around. Exercise is important for all pets to prevent obesity and other health complications. 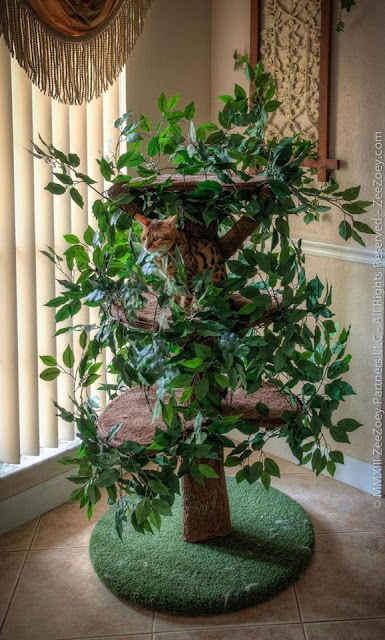 A cat tree would be ideal where he can climb easily and use his three limbs in a limited environment like his condo. 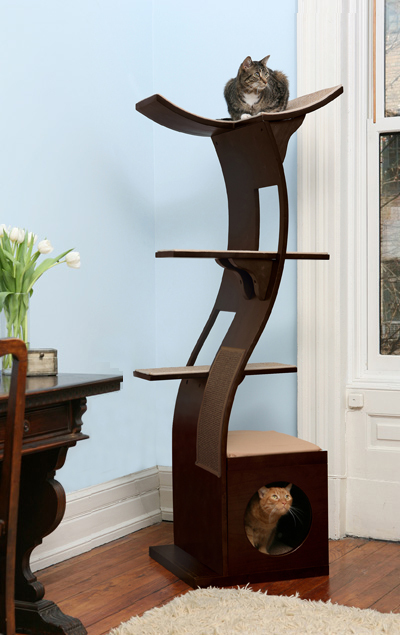 If anyone would like to donate a cat tower here are a couple that would fit in his new home. Please email us for an address riverfrontcats@yahoo.com. These happy endings keeps us going in this tough line of work. Everyday we receive emails and calls of residents finding kittens, someone having to give up their pet cat, an elderly person who has passed and loved ones struggle to find homes for their pets...So we revel in these few victories, these precious moments. Thank you for your support. Thank you for caring. We're a Petties Finalist! 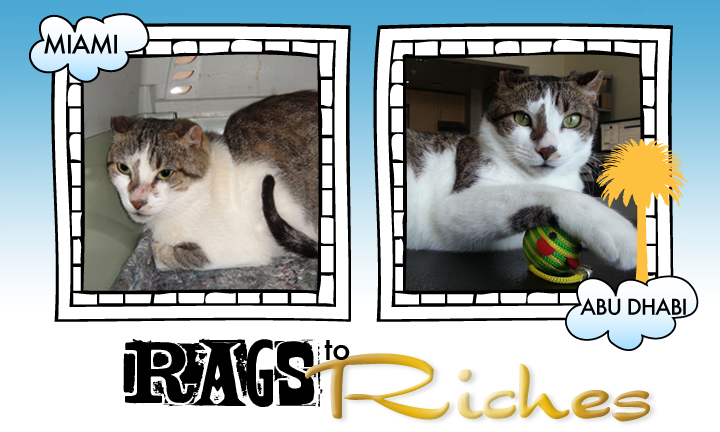 Please remember to vote daily until July 31 in the Petties to help us win an award and a donation. This will help us pay Leroy's vet bill and save more stray, feral and black cats! Here are the three categories to vote for to help us win! Here is the link to log in and vote. 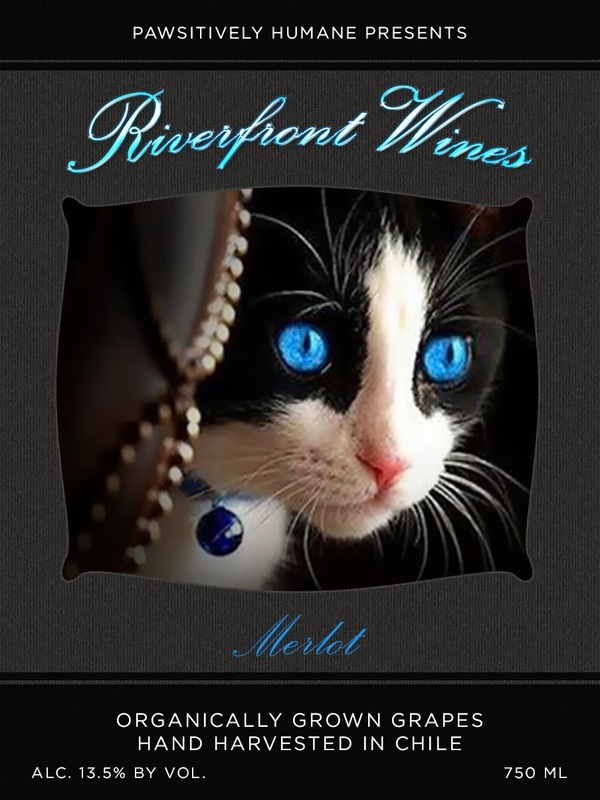 Riverfront Cats is proud to share our first music video (and in Spanish!) to create awareness about homeless pets. 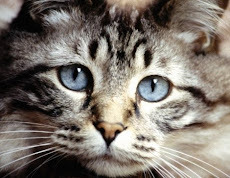 While the video is about dogs (perros), naturally the message is universal to all pets including cats. The brainchild behind the video is Silvia Rosales Del Monico who is also featured in the video. She is a singer and actress in the Spanish speaking media in the U.S.. Our founder Christine Michaels, received a call from Silvia who lives nearby. 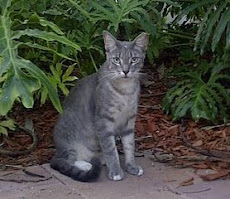 Silvia and her husband Dan had found stray kittens in their neighborhood in Little Havana and asked for guidance on how to help the kittens. Together Christine, Dan and Silvia teamed up to ensure the kittens were captured, taken to the vet for checkup and vaccinations and placed in loving permanent homes. Christine also taught Silvia and Dan how to use a cat trap to humanely trap other stray and feral cats in their neighborhood to get them spayed and neutered. Silvia and Dan's genuine concern and love for animals lead to ongoing conversations on how to raise awareness and reach the masses to reverse the rate of homeless pets. They are the proud owners of four rescue cats. We thank Silvia for investing her time and talent in coordinating this video to reach the Hispanic audience and sharing the powerful message that adopting stray dogs bestows as much love and energy as any other pet and that pet ownership is a lifetime commitment. 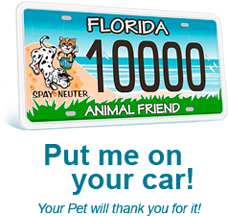 Pets (dogs and cats) provide unconditional love and companionship and we must do the same. Protect and love your pet as they would do the same for you. Please enjoy the video. The lyrics are in Spanish with English subtitles. Los Gatos de Riverfront se enorgullece de compartir nuestro primer video de musica en español para crear conciencia acerca de las mascotas sin hogar. Mientras que el video es sobre perros, naturalmente, el mensaje es universal para todos los animales domésticos como los gatos. La idea detrás del video es Silvia Rosales Del Monico quien también aparece en el video. Ella es una cantante y actriz en el medio artístico en español en E.E.U.U. Nuestra fundadora Christine Michaels, recibió una llamada de Silvia que vive cerca. Silvia y su esposo Dan habían encontrado gatitos callejeros en su barrio de la Pequeña Habana y pidió orientación sobre cómo ayudar a los gatitos. Juntos, Christine, Dan y Silvia se unieron para asegurar que los gatitos fueran capturados, llevados al veterinario para un chequeo y sus vacunas y colocados en un hogar permanente. Christine también enseñó a Silvia y Dan cómo utilizar una trampa de gatos para atrapar humanamente otros gatos asilvestrados y callejeros de su barrio para esterilizarlos y castrarlos. La genuina preocupación de Silvia y Dan y su amor por los animales condujeron a conversaciones continuas sobre la forma de crear conciencia y llegar a las masas para revertir la tasa de mascotas sin hogar. 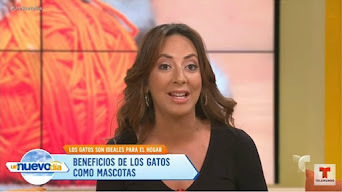 Ellos son los orgullosos propietarios de cuatro gatos rescatados. Por favor, disfrute el video. La lírica es en español con subtítulos en inglés.